Get stroke rate, stroke count and elapsed time with absolutely no wiring or installation required. Please choose your bumper colour from the options below before adding to basket. The StrokeCoach you love, updated with 21st Century technology! 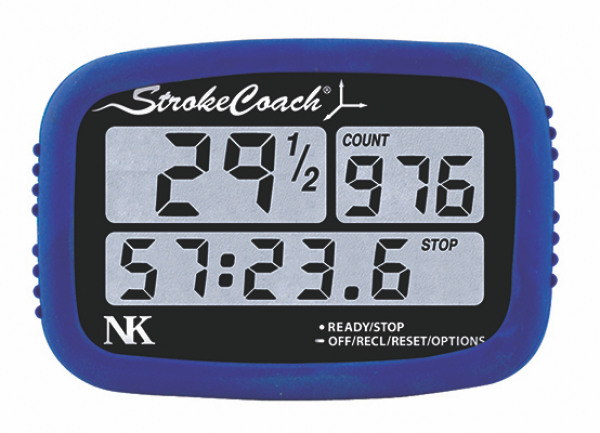 The StrokeCoach with Surge Rate provides every StrokeCoach function – stroke rate, stroke count and elapsed time – with absolutely NO wiring or seat magnet required! NK’s proprietary stroke algorithm, combined with a sensitive three-axis accelerometer, gives immediate accurate stroke rating in any boat – rowing shell, dragon boat, canoe or kayak – and in any position. The StrokeCoach Surge comes with a convenient "strap-on" mounting dock that makes short work of attaching it to your boat. Have a team boat? No problem! The StrokeCoach with Surge Rate will give you an accurate stroke rate in ANY seat in the boat! And, in response to your requests, we've added a backlight so no more flashlights during those early morning rows. Our test team of rowers and paddlers have told us loud and clear - this might be the most useful addition to the NK® line ever! The mounting strap is highly-adjustable and designed to quickly secure the unit to a footstretcher plate, cross-brace, wing rigger, bench seat or a coxswain’s or drummer’s leg. You can also use a traditional T or A bracket with a wireless mounting dock. If you find yourself in a wired boat, the mounting dock can still be used to hold the StrokeCoach with Surge Rate, so even if your club needs to pay a little more attention to their wiring, or the seats have gotten switched around (again), you’ll be in business. We're developing additional mounting options as well to ensure we give you a solution for every kind of boat you want to row or paddle. Chronograph: 00:00.00 to 59:59.99 with auto roll-­‐over, 1/100th second resolution. Stroke Rate: Rate input from accelerometer, auto start with first stroke, 10-­‐115 SPM range, 1/2 SPM resolution. Stroke Count: Rate input from accelerometer, auto start with first stroke, 0 to 999 with auto roll-over, 1 stroke. Memory: Stroke rate and count automatically stored every 10 seconds, up to 1hr. Display: High contrast monochrome LCD. Backlight: Blu/green electroluminescent backlight, auto-on. Controls: 1 buttons with tactile response. Battery: 2 CR2032 (1 display, 1 backlight). Battery Life Expectancy: 175hrs, backlight battery: 20hrs. Power Conservation: Auto-off after 8 minutes of no accelerations or button presses. Size: 3.5 x 2.3 x 0.8 in (88.9 x 58.42 x 20.32 mm). Control Unit Weight: 3.5 oz (99.2 g) for control unit. Buoyancy: Control unit alone floats. Control unit with bumper and lanyard does not float.